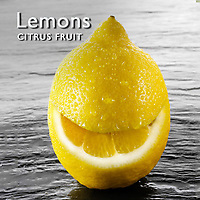 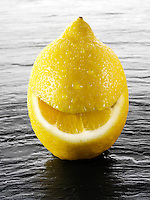 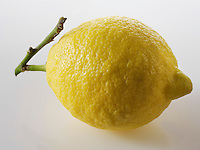 Professional lemons royalty free photos with pictures of fresh whole lemons & images of cut lemons. 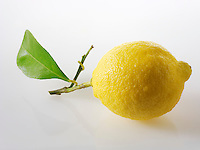 The lemon is both a small evergreen tree (Citrus × limon, often given as C. limon) native to Asia and the tree's oval yellow fruit. 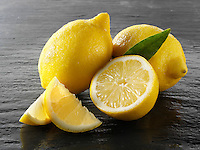 The fruit is used for culinary and nonculinary purposes throughout the world – primarily for its juice, though the pulp and rind (zest) are also used, mainly in cooking and baking. 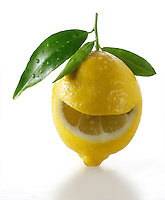 Lemon juice is about 5% to 6% (approximately 0.3M) citric acid, which gives lemons a sour taste, and a pH of 2 to 3. 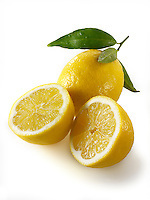 This makes lemon juice an inexpensive, readily available acid for use in educational science experiments. 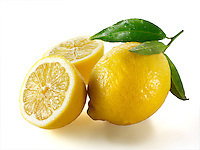 Many lemon-flavored drinks and candies are available, including lemonade and sherbet lemons.The distinctive sour taste that lemon juice gives, makes it a key ingredient in many dishes across the world. 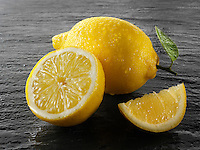 Lemon juice is used to make lemonade, in soft drinks, and as a marinade for both fish, where its acid neutralizes amines in fish by converting them into nonvolatile ammonium salts, and meat, where the acid partially hydrolyzes tough collagen fibers tenderizing the meat. 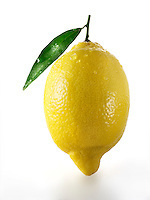 Lemon zest, the grated rind of the fruit, is used to add flavor to baked goods, puddings, rice and other dishes.